Once again, I’ve grown various varieties of new potato in sacks and tubs. The Charlotte potatoes had a great taste, although the yield was a bit disappointing (possibly due to user error though). Rocket and Vivaldi were okay but nothing special. But my biggest potato success this year has been the Pink Fir Apple. They are knobbly, pink tinged tubers with a really nice flavour – perfect for potato salad as they hold their shape well and don’t disintegrate if you accidentally over-cook them. I will definitely grow them again next year. Scrub and boil some new potatoes. Prepare runner beans (I like to use a slicing gadget for mine) and steam. Meanwhile, fry some chunks of chorizo (you won’t need to use much olive oil as the chorizo will give up its own oil). Once cooked, remove from the pan and drain on some kitchen paper. When the potatoes are coooked, add some olive oil to the chorizo pan and fry until golden all over. Add the chorizo chunks back into the pan and re-heat briefly. 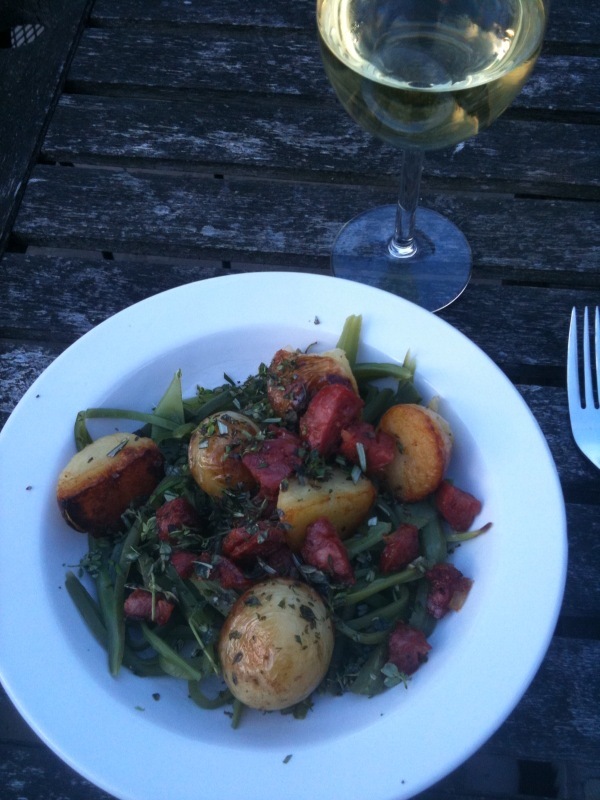 Serve the potato and chorizo mixture on a bed of runner beans. Scatter over a mixture of whatever herbs you have to hand. Season and serve.